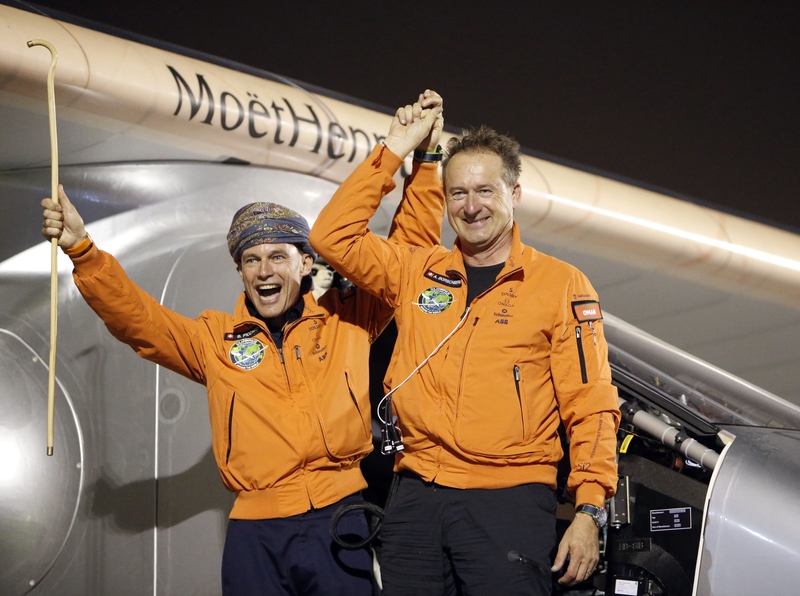 Two Swiss pilots on Tuesday began the second leg of an historic solar-powered flight around the world. André Borschberg and Bertrand Piccard will continue to take turns controlling the single seater Solar Impulse 2 as they complete the 21,747-mile journey. The men's five-month trip started Monday morning after they took off from a Abu Dhabi airport in the United Arab Emirates. The flight will make 12 stops as the plane circles the globe. Powered only by the sun, the Solar Impulse uses 17,000 solar panels on the wings and fuselage. Lithium batteries store energy to fuel the plane when the sun goes down at night. The journey will be like driving a car around the world. According to The Guardian, the plane weighs about the same as a Volvo sedan and goes at comparable speeds. Although the Solar Impulse is capable of flying 87 miles per hour, Borschberg and Piccard will fly at half that speed to conserve battery. The cockpit is roughly the size of a car but holds the life support systems, food, and the pilot's chair, which also serves as a bed and toilet. Piccard, a psychiatrist who belonged to the first team that circled the world in a balloon without landing in 1999, taught self-hypnosis and meditation techniques to himself and Borschberg to help them concentrate on flying the plane for hours on end. The men will survive on 20-minute naps for every two to four hours since the plane needs constant attention. Time is not so important anymore. You have plenty of time and the only way to cope with this duration is to be in the present moment. If you start thinking about how many hours left until you get to the destination you get crazy. So the only way is to be present ... In some ways it’s almost a spiritual experience that we are going through. The Solar Impulse, already the first solar-powered plane to fly overnight and between two continents, could be the first step toward larger, commercial zero-carbon planes. Huge Boeing planes weigh more than 66 times the weight of the Solar Impulse and produce 53.3 pounds of carbon dioxide per mile flown. Solar-powered planes could change aviation's giant contribution to climate change, Borschberg told The Guardian that it won't likely be a reality for decades.